Posted on April 21, 2017 by Matthew Leib. This entry was posted in Faculty Friday, Spotlight and tagged Faculty Friday, Husky Green Award, sustainability. Bookmark the permalink. Somewhere along the way to hauling yet another five-liter jug of water up to her second-floor room in a small village high in Morocco’s Atlas Mountains, Kristi Straus decided enough was enough. She paused and looked around, reflecting on the community of subsistence farmers with whom she’d spent the past two years as a 22-year-old Peace Corps volunteer. That these farmers’ level of subsistence belied an underlying richness to their existence stuck with Straus for the next 20 years. Today, as lecturer in the University of Washington’s Program on the Environment, she’s passing that lesson along to undergraduates. The result was Environment 239: Sustainability: Personal Choices, Broad Impacts, a course in the Program on the Environment that combines lecture with readings, discussions, and research- and reflection-based writing exercises to encourage students to consider the meanings of “sustainability” in individual, communal, and cultural contexts. As references, students draw on textual evidence and their own lived experience, including interviewing elders in their community about changing habits and expectations over time and undertaking personal challenges such as carrying all the garbage and recycling they generate everywhere they go for a week—an activity Straus participates in alongside her students. Students also write a short research paper about how people can eat to live more sustainably. At the end of process, they spend a week eating as close as possible to their ideal diet given their own constraints. “Maybe they live in a sorority house, maybe they’re a varsity athlete, maybe they don’t have very much money,” Straus says, acknowledging that students do have certain limitations. But by tailoring their study to their own life, Straus hopes students learn to examine more critically this interplay of wealth, waste, and want—first on an individual level and then in a broader cultural context. Straus cites the fact that, in Seattle, it’s decidedly more difficult to use public transit to move east-west than it is to go south-north and that many in the city and surrounding area drive even when they might prefer not to. In the spirit of societal impact, Straus’s sustainable choices course also offers students optional service learning opportunities to work within the UW or Seattle community on topics such as pedestrian advocacy, sustainable business, and environmental education. 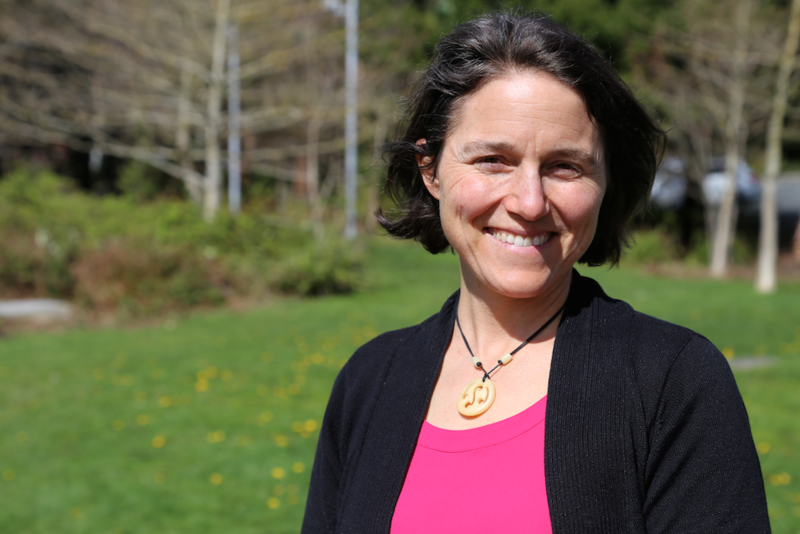 In sum, it’s about helping students put a methodology behind the act of being mindful and one of the reasons why Straus will be honored this week with a Husky Green Award, along with the UW’s Distinguished Teaching Award in March. “I think that being a UW lecturer is the best job because I get to focus on teaching,” Straus says, adding that the uniquely open structure of the Program on the Environment, which draws on faculty from across the University to contribute their pedagogical perspectives to the program, creates an even more conducive environment that allows her to focus on her teaching craft. Straus credits UW faculty Bob Francis and Julia Parrish as having been “amazing” mentors during her time as a graduate student, earning her Ph.D. from the University of Washington’s School of Aquatic and Fishery Sciences. “Both of them were incredible professors who valued teaching,” she says. Straus says Francis, with whom she worked during her first year of graduate school, taught her to “treat your TAs as peers.” She says they would sit as a team every week, mapping out their goals and how to deliver on them. In turn, Straus says Parrish taught her how to get students to hold themselves accountable by holding each other accountable. She relates how Parrish would give pop quizzes only when students asked for them. While “enough is enough” may serve as Straus’ mantra when it comes to checking the hazards and excesses of consumer culture, there’s much more in store for the next iteration of the sustainability-focused course this coming fall. Inspired by the UW Teaching and Learning Initiative, Straus is launching a collaborative online learning and study abroad experience in partnership with Tsinghua University in China, which she dubs an “international flipped classroom.” While China leads the world in greenhouse gas emissions, Straus is quick to add that, per person, their emissions are “quite low” and that the U.S. ranks second. “We’re trying to think more deeply about how culture defines sustainability and are there solutions we can think of, cross-culturally, that we might not think of on our own,” Straus says, adding she hopes students on both sides of the Pacific will use the course to gain real-world experience collaborating as part of an international, multi-lingual team. UW and Tsinghua students will work together online to learn course material, co-creating written and video assignments about sustainability in their lives and cities for the 10 weeks of autumn quarter. In addition, Chinese students will likely visit the UW in October, while UW will make the trip to China in December. “Clearly if we’re going to move toward global sustainability, we need the U.S. and China on board,” Straus says of the critical need for cross-cultural collaboration in the coming century. It’s as much about collectively conserving our environment as it is about salvaging the connections we have to each other. “We’re so busy trying to get ahead to have more stuff that we don’t think about our happiness very often,” Straus says, citing studies that point to diminishing contentedness for citizens the world over. A lecturer in the College of the Environment’s Environmental Studies program, Kristi Straus holds a B.A. in Biology from Colby College and a Ph.D. from the University of Washington’s School of Aquatic and Fishery Sciences. The Husky Green Awards will be presented in a ceremony on Red Square on April 21 starting at 1 p.m. as part of the UW’s Earth Day celebration. America was indeed happier in the 1950’s than it is today. Good last line quote. We all need to go back to basics — not just be little worker bees scrambling to pay the bills and feed the government its tax share. A simpler life would be a happier life for so many. Let’s hope all those strip malls across America somehow turn back into parks and farms someday.